Email Jamie at info@blueprint-photography.com to order! Book NOW for half off your session fee, AND keep the Black Friday Specials at your Ordering Appointment! Please note: digital images are not discounted for Black Friday specials. Must book newborn session with deposit by Thursday November 29, 2018 for special rates. EMAIL info@blueprint-photography.com to order: Send the exact file name and size/product (ex: PERSON001–16×20 canvas). An invoice will be sent within 48 hours, and MUST be paid within 48 hours of receipt. 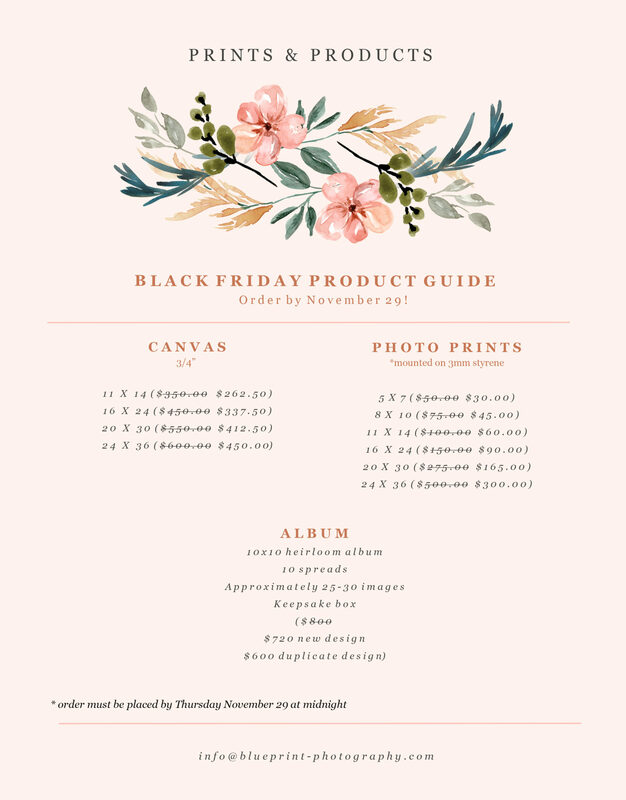 Please refer to the chart below for Black Friday Pricing!